Happy (Lunar) New Year everyone! I hope this post finds everyone happy and well. 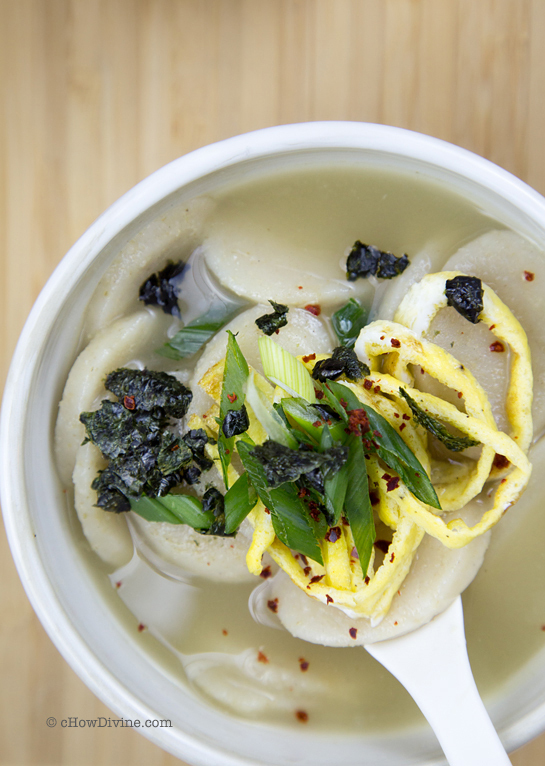 In a Korean home, a new year celebration always involves tteokguk or manduguk. When I was little, I was told that I couldn’t become a year older if I didn’t consume a bowl of tteok guk on New Year’s Day. Although that sounds like a nice proposition at this point in my life, I couldn’t wait to get older back then. But one thing has stayed constant. I still don’t need any excuses to devour a bowl of tteokguk. It’s one of my favorite cold-weather soups. This is a super simple recipe that can be enjoyed anytime of the year. Although it is commonly consumed on new year’s day, it’s a perfect cold-weather dish. In fact, we’ve been enjoying tteokguk all throughout January, thanks in part to a huge-mongous pot of brisket stock I made at the end of last year! But no worries my friends. You don’t need homemade stock for this dish. A store-bought stock will do. I apologize for the long absence. I just needed some time to recharge. I will get to and answer all questions and/or comments in the next week. Place the sliced rice cakes (“tteok”) in a bowl full of water. Allow to soak for 15-20 minutes. In a small bowl, lightly beat 1 egg with a pinch of salt and pepper. Heat a small nonstick pan over medium heat. Oil the pan and pour the egg into the pan. Cook on both sides (like a thick crepe) until golden brown. Remove from heat and slice thinly. Set aside. In a pot, bring the stock to a boil over moderately high heat. Add the tamari and 1/2 tsp of salt. Stir. Add the slice rice cakes (“tteok”) to the boiling stock. Lower the heat to medium and allow to boil for about 5-7 minutes until the tteok is cooked through. While the tteok is boiling, toast the laver (“gim”) directly over low heat or on a pan over medium heat. Toast both sides until crispy or no longer limp. Crush the toasted gim using your hands. Set aside. Once the tteok is cooked through, add the chopped scallions to the pot and stir. In a small bowl, lightly beat 1 egg with a pinch of salt and pepper. While stirring the pot in a circular motion, slowly drizzle in the egg. As soon as the egg sets (should be immediate), remove the pot from heat. Salt to taste if necessary. Divide the soup into 2 bowls. Top with sliced eggs from step 2 and crushed gim from step 4. Sprinkle with freshly-ground black pepper and additional chopped scallions if desired. Serve while hot. You can use just one egg, and omit either the pan-cooked egg in step 1 or drizzled egg in step 5. But it’s so good with both! I used homemade brisket stock. I will post the recipe for the stock sometime this weekend. (Update: The recipe has been posted and can be found here). It’s not as convenient as a store-bought broth or stock, but it’s pretty easy to make. I usually make a huge pot and freeze for later use. Thanks Sue! Happy New Year to you too. Hope you and your family are healthy and happy! Thank you John! Feels like it’s been ages. 🙂 Happy New Year to you too! You’re back! I have missed reading your posts. I just blogged about ddukguk too some days ago. It’s been nice to eat it during the cold days. Good to hear from you Miss Kim! There’s nothing like tteokguk in January right? It doesn’t feel like new year without it. I hope you’re doing well! I wish you great year ahead full of love, good health and success! Welcome back Darlin! You’ve been missed! Looks like you got recharged because this is a great recipe to return with. It looks very simple and quite delicious! I just learned more about rice cakes over at With a Glass, and how not all rice cakes are sweet. In looking up tteok (thanks for the Korean word! ), I see that it is a savory cake which gives me a better idea of the flavors in this soup. I love the egg topping!! Thanks MJ! So good to hear from you. I guess I’ve been running on empty for a while, because it took me a little longer than I had planned to refuel. 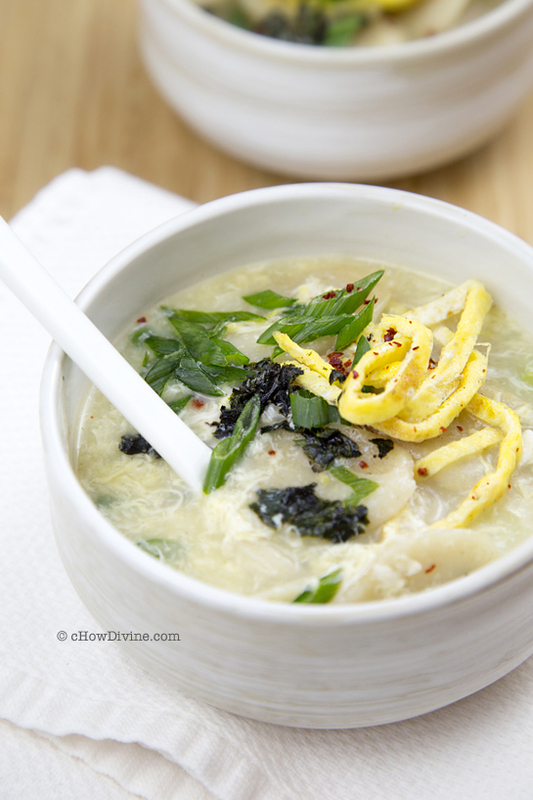 :) This soup is a must in January for Koreans. The rice cakes used for this is chewy in texture and, yes, savory. They are quite delicious stir-fried as well. I hope the new year is filled with nothing but happiness for you and yours!